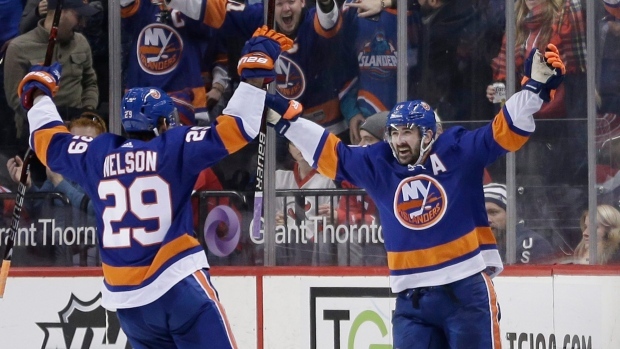 NEW YORK — The struggling Islanders desperately needed a boost and thanks to rookie Sebastian Aho, they received a lift heading into their bye-week break. The 21-year-old Swedish defenceman scored his first NHL goal with his team down two scores in the third period, then assisted on the tying goal by Cal Clutterbuck before the Islanders won in the shootout, 5-4 over the New Jersey Devils 5-4 on Sunday to snap a five-game skid. "There's no panic in his game. He's come in with a lot of poise," Islanders captain John Tavares said of Aho, a fifth-round draft pick by the Islanders last June who was playing in his third game. "Over the course of a season, we need everybody to make contributions." Brock Nelson scored the only goal of the shootout to give the Islanders (21-18-4) their first win since Dec. 27. Nelson beat Devils netminder Cory Schneider in the fifth round. The Devils had a grand chance to win in overtime when Tavares was assessed a tripping penalty halfway through, but New Jersey did not register a shot on goal. Jaroslav Halak made 42 saves for the Islanders, who were badly outplayed over their five-game stretch of losses in which they were outscored 25-8 and didn't register a point. The Devils (22-11-8) lost their fifth straight before both teams start a league-mandated five-day break. Two of the five losses have come in shootouts and one in overtime. "When you have a two-goal lead, you've got to learn to lock it down," Devils coach John Hynes said. "Little things make a difference." Clutterbuck and Aho tied the game after Miles Wood and Taylor Hall had given the Devils a 4-2 lead early in the third period. Clutterbuck's tying score came at 15:43 after Aho narrowed the deficit to 4-3 with his first goal at 7:58. Aho's power-play goal was assisted by Tavares and Mathew Barzal, who leads all rookies with 26 assists. "It's huge. It's a special moment," Aho said of his first goal. "I've been dreaming out it since I was a little boy." Wood's 11th goal this season came at 2:41 of the third and snapped a 2-2 tie. Hall made it 4-2 for the visitors at 3:18 with his 15th goal, after which Halak smashed his stick against the net in frustration. Islanders coach Doug Weight credited his goaltender's burst of emotion for giving his team an extra jolt. "Jaro was obviously excellent," Weight said. "Hopefully we will look back at this win. It was a really great effort by the guys." Travis Zajac's fifth goal of the season and second of the game at 16:25 of the second came while the Devils were short-handed and tied the game at 2. It was the ninth short-handed goal allowed by the Islanders this season. Zajac was perplexed and frustrated by the game's ultimate outcome. "We can't hold leads these last five games," said the 32-year-old forward in his 12th season with the Devils. Anthony Beauvillier put the Islanders ahead 2-1 with his fifth of the season at 10:44 of the second after Zajac scored his first of the game at 4:43 of the middle period. The Devils came out flying and had a 15-1 shots advantage just six minutes into the game — and outshot the home team 21-10 overall in the first — but it was the Islanders who scored first when Anders Lee knocked a rebound past Schneider for his 25th goal at 15:28. The Islanders were without injured forwards Josh Bailey and Andrew Ladd for the first time this season. Both were hurt during Friday's 4-0 dismal home loss to Pittsburgh. Bailey with Tavares and Lee combined for 57 points in December, making the trio the highest scoring line in the league. The Islanders also continued to miss key defencemen Johnny Boychuk and Calvin de Haan. Boychuk has been out for the past six games while de Haan hasn't played since suffering a shoulder injury in an overtime win over the Los Angeles Kings on Dec. 16. "We found a way in the third period," Halak said. "We need to get back after the break and start playing Islander hockey." Alan Quine took Bailey's place on right wing on the team's top line with Tavares at centre and Lee on the left. Despite missing a litany of top players, Weight was heartened by his squad's compete level, especially when trailing in the third with a sixth straight loss less than five minutes away. "We played the right way," Weight added. "I think we tired them out. They are a fast team but we generated a lot of offence. This was a big one for us heading into the break." NOTES: The Devils are 11-2-8 in one-goal games. ... The teams meet again at Barclays Center on Jan. 16, then in Newark on Feb. 24 and March 31. ... The Devils played with 11 forwards and seven defencemen, scratching forwards Drew Stafford, Jimmy Hayes and Stefan Noesen. ... The Islanders scratched defenceman Dennis Seidenberg. Devils: Next Saturday at home against Philadelphia. Islanders: Next Saturday afternoon at Rangers.